PARIS, France -- The Paris prosecutor says that the truck driver who killed 84 people in Nice had expressed support for the Islamic State group and searched online for information about the Orlando attack on a gay nightclub. Prosecutor Francois Molins, who oversees terrorism investigations, said Monday that slain attacker Mohamed Lahouaiej Bouhlel had clearly plotted out the Bastille Day attack, with reconnaissance visits to the beachfront where he plowed down revelers on Thursday. Molins described a quick radicalization of a man who in the past hadn't been religious. He said a review of Bouhlel's computer and phone showed online searches relating to IS, other jihadi groups and violent images. Molins also said Monday that officials have begun returning to families the remains of some of those who died in the attack in Nice, on the French Riviera. 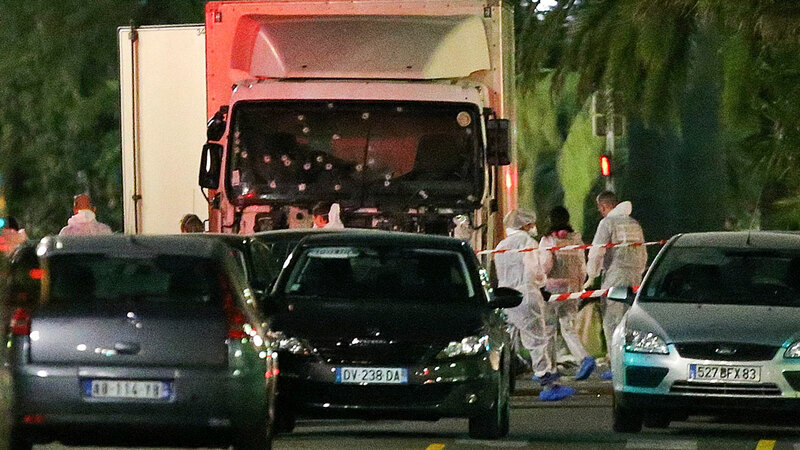 The attack occurred when Mohamed Lahouaiej Bouhlel, a Tunisian living in Nice, drove his truck through a crowd. Meantime, French officials say police found 11 telephones, cocaine and 2,600 euros ($2,900) in cash at the home of a suspect held in the investigation into the deadly Bastille Day attack in Nice. The suspect is among seven people in custody in the probe into last week's attack, which killed 84 people. Three of the suspects were brought to French intelligence headquarters in Paris on Monday to face eventual terrorism charges, according to a security official. At the home of one of the suspects, an Albanian national, investigators found the phones and cocaine, according to that official and the Paris prosecutor's office. They wouldn't elaborate on the relationship between the suspect and attacker Mohamed Lahouaiej Bouhlel, who was killed by police after ramming a truck through a crowd watching fireworks. A family friend of a 22-year-old Australian woman seriously injured in the Bastille Day attack in Nice says a "wonderful stranger" stayed by her side throughout the ordeal and continues to visit her daily in the hospital. Debbie Cook told reporters outside the Pasteur hospital Monday that her friend, 22-year-old Adelaide Stratton, suffered serious injuries but that "she is getting better every day." She said Stratton cannot speak and does not remember the attack, "which is better." She declined to discuss the injuries saying that the family wants to protect Stratton's privacy. Cook, who was traveling in Europe and came to Nice to assist Stratton, said a French man aided Stratton in the critical period after the attack. "A complete stranger stayed with her in the immediate stages after she was injured and went in the ambulance. And bless him, he has been at the hospital with her most days," Cook said.